Smart phone technology is advancing, and phone books have all went online. Some business owners believe that people still use the phone book…this is true, however the number of users diminish away by the day. As a matter of fact, Phone books have become so out-dated in today’s business world. Moreover, they themselves have gone online. PC use has been mobile for so long that now even laptops are becoming obsolete …what do you think that has done to the mighty phone book? Smart Phone technology has taken over where the laptop computer has fallen short. 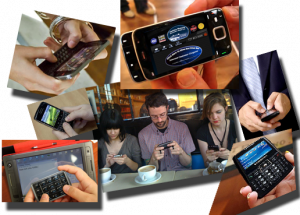 These hand-held devices are in the hands of millions of consumers and those numbers grow daily. These consumers don’t have time to sit and surf the web to find your website …not that they did before, but now it has become even more challenging to grab visitors. And also, search engine users don’t spend more than an average of 1 minute and thirty seconds on a website before they find what they want or leave to look for another website that will provide them with what they are looking for… which brings us back to the phone book option. If you are on a phone book web page, you are listed with everyone else doing and selling what you do. If you are on the top you might see some activity, but if your website is above the phone book listing on the search engine, you will appear above your competition and capture visitors before they even see the phone book listings. The phone book mentality is costing you money! How much longer are you going to lose business to the guy that can be found in his phone? You see its not the phone that is outdated… its the book. Look at it this way, how many times do you want to compete with others to get someone to call you? Converting hits into sales can happen in seconds! If you are the one on top and your website has enough information to close the deal …you win. It is that simple. One very important fact to remember is: Smart Phone Technology has made it easier to find what people are looking for faster. The word to remember here is FASTER. If you are buried under 100 other competitors, your phone won’t ring.